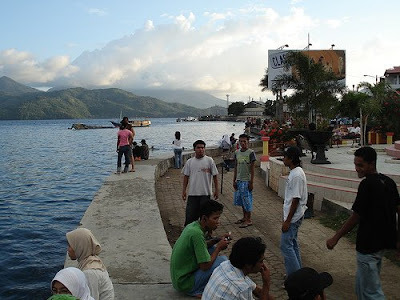 This small island, and the city of the same name, is the transport and administrative centre for North Maluku. It is best to start a tour of the region here. The gateway is Bitung, N. Sulawesi, 1 hour from the capital of Sulawesi Manadu,. You can get here by Pelni from several ports. Then from Bitung, local ferries to Ternate, 2 boats/week. Also Pelni ships run from as far as Sumatra or Papua as well. Many ships run to most other islands in N. Maluku, but they leave from different harbors. to Sanana in the Sula Islands (100 000Rp) local ships 2 boats/week. to the small islands south of Ternate, such as Tidore (throughout the day), Moti, Makian, Kayoa (in the mornings), Bacan(65 000Rp) and SW Halmahera (both in the evening). to Sidangoli on Halmahera (10 000Rp), speedboats leave at 7.00, connecting with cars up NE Halmahera there. to Jailolo on Halmahera, speedboats. From where cars go up the NW coast of the island. $ Danamon Bank: On the Main Road. Cash advances is available. h1 HOTEL INDAH: Jl.Busiori No.3, T(0921)21334, f s30 000, d45 000, a/c s45 000 d60 000 Very clean and cheap so often full. h2 HOTEL SEJAHTERA: Jl.Salim Fabanyo No. 21, T(921)21139, f d35-50 000, More basic, but near the Indah, if that is full. There are plenty of cheap eating places all over Ternate Town. Of the other islands in the region, only Soa Siu on Tidore, Daruba on Morotai, Labuha on Bacan and Sanana on Sula have hotels. On the other islands one can stay with local people, but for that it is necessary to speak Indonesian.